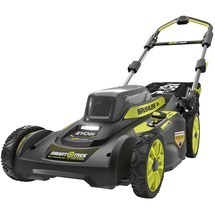 *Based on TraQline 2018 Dollar and Unit Brand Share Sales Data for Walk-Behind Cordless Mowers in the U.S.
RYOBI 40V Lithium delivers GAS-LIKE POWER™ and cordless convenience with over 40 tools that all run on the same battery platform. Each tool is uniquely engineered with cutting edge innovation and smart technology. Enjoy automated convenience on your next DIY or Home Improvement Staple Project with the all new 18V ONE+™ 3/8” Crown Stapler. Compression Drive Technology allows you to fasten heavy duty 3/8” Crown Staples effortlessly no matter the application. You've got the tools, now what? RYOBI Nation has everything a DIYer needs to tackle the next project. Get motivated with How-To Plans, member submitted projects, and a community of DIY enthusiast ready to cheer you on and offer advice. Even hare project for a chance to win! RYOBI Landscapes offers advice, instruction and inspiration for lawn and garden enthusiast aspiring to boost their home’s curb appeal. Here you’ll find helpful how-to maintenance, operation and buying guides for outdoor tools and so much more! Looking for savings? Browse the best deals of the season and don't miss your chance to save on select Combo Kits, Tools, and Accessories. Offers May Vary. Limited Time Offers. While Supplies Last. Available exclusively at The Home Depot. SAVE MONEY. SAVE TIME. SAVE SPACE. RYOBI EXPAND-IT™ Attachments are easily the smartest way to buy, use and store outdoor power tools. Expand a RYOBI Power Heads capabilities by choosing from over 10 attachments for trimming, edging, pruning and so much more!